A calendar for the West Coast featuring a graphic look at the Gulf of Georgia tides has been developed over the years by R.D.Penhall Ltd. 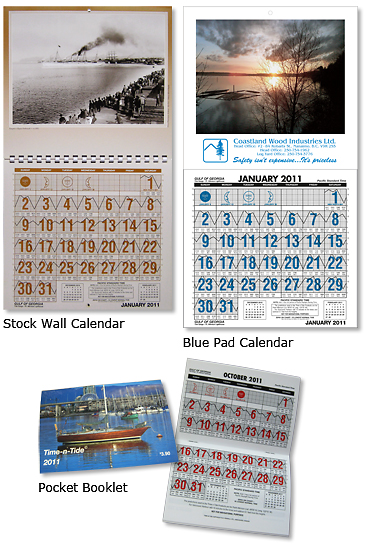 The wall calendars and pocket books are a useful, easy to read guide for monitoring tide levels in the Gulf of Georgia. The R.D.Penhall Ltd. stock wall calendar (10-1/2" x 18-1/2") is available for purchase featuring old area photos of Vancouver or it can be customized by printing your company information in the space below the photo. A wall calendar (10-1/2" x 19-1/4") can be printed using your colour image and company information on the top half of the card stock with a 12 month blue pad stapled to the bottom half. We can also create a custom full-colour wall calendar using your supplied images and company information for each month of the year. R.D.Penhall Ltd. Time-n-Tide pocket memo books (4" x 5-3/4") can be purchased with our in-house cover or can be custom printed with your own personalized cover.